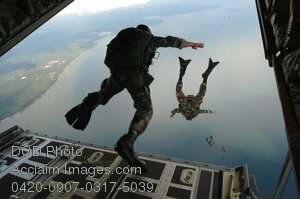 Description: Free, public domain image: U.S. Air Force Airmen Jumping Out of a C-130J Hercules Aircraft. U.S. Air Force Airmen from the 720th Special Tactics Group out of Hurlburt Field, Fla., jump out of a C-130J Hercules aircraft during water rescue training over the Destin coastline in Florida Oct. 3, 2007. The training is designed to enhance aerial zodiac deployment and personnel recovery. The aircraft belongs to the 41st Airlift Squadron out of Little Rock Air Force Base in Arkansas. DoD photo by Senior Airman Julianne Showalter, U.S. Air Force.